The Epson TM-U230 has been discontinued. No direct replacement is available. Epson's TM-U230 single-station impact printer is ruggedized to provide reliable, high-quality performance in kitchen environments. EPSON's TM-U230 single-station impact printer is ruggedized to provide reliable high-quality performance in kitchen environments. Built with the same high quality and reliability of EPSON's best-selling TM-U200B impact printer the new TM-U230 offers fast two-color order printing and an exceptionally durable case that stands up to harsh kitchen conditions. Two-ply Impact, 3" width x 100' length. 1st copy is white, 2nd copy is yellow. 50 roll case. Receipt Paper, 3" width x 67' length, three-ply impact paper. 50 roll case. 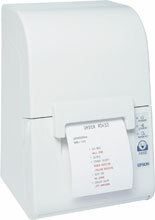 TM-U230 single-station impact printer is ruggedized to provide reliable, high-quality performance in kitchen environments. Built with the same high quality and reliability of EPSON's best-selling TM-U200B impact printer, the new TM-U230 offers fast, two-color order printing and an exceptionally durable case that stands up to harsh kitchen conditions.